Canadian road pro Zach Bell's team, Team SmartStop, has released an interview with Bell as the season concludes. At the end of 2013, Michael Creed signed Zach Bell to race for Team SmartStop for the 2014 season, little did he know that Zach would fully encompass the work ethics and dedication that he was looking to instill into his new team. This year Zach has taken on the role as the team captain and has been a great mentor and teammate to the younger members of the team. Michael said: "Having Zach at a race is critical, he is the outright team captain. He is very tactically aware and it is calming for me having him in the race, I get a sense of relief because I know things will go okay. Zach has had a massive year this year with the team, which has included highs and lows. 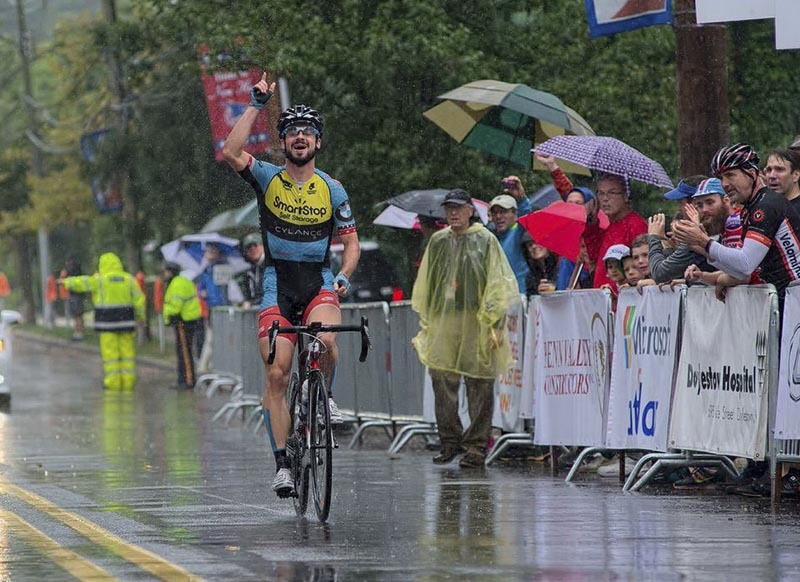 After winning the Bucks County Classic in September we talked to him about his big win, becoming a father again and life on and off the bike. Question: You dedicated your win at the Bucks County Classic to your late son, Paxton, tell us about that win, what it meant to end the season on a high and your Paxton Lights initiative. Zach Bell: To go out like that was a great personal achievement. I had fought hard for the team and for a result all year and not pulled down a top step result. To top it all of it was on the 13th and my first born, Paxton, was born on the 13th of October. We lost him a few days later due to what have remained somewhat inexplicable complications. Those where some of the hardest days of my life. I had to battle with demons and questions about my life and cycling and what my future was. Working through that and coming out of it has changed the person and the cyclist I am. BC Womens Hospital, the support staff and doctors there, provided great care and support for my family in the time. Although we lost our son I have never seen a group of people work so hard and with such tenderness for what was a life in hopeless circumstances. To honor our sons memory we have started a fundraising campaign callled "Paxton's Lights for Hope". Candles are sold leading in to Canadian Thanksgiving for families to burn at their family gatherings in honor of lost children, family members or simply as a sign of solidarity to those who have. The funds go to the NICU in the hospital to help them to provide access to that care for more people. Q: You are a father to a beautiful daughter, Lucy, how has becoming a father to Lucy changes your life and do you think this will affect your approach to cycling in the coming years? ZB: Lucy and Paxton have both changed things for me in a huge way. Lucy is my hope. My reminder that the future can brighten at any moment. She reminds me that facing something terrifying is the only thing that leads to growth. Trying again was scary for us, but if we could not face that challenge we would not have her. You have to seize every moment you can, even if it is challenging, even if it uncomfortable or scary. All those moments have a Lucy at the end of them. I don't know how she will change my cycling career. She certainly serves as a reminder that cycling is not everything and not the hardest thing. For me that makes the challenges of the sport easier to face. Q: You competed in the 2008 and 2012 Olympics, placing 7th and 8th respectively. What's been your favorite take away from your Olympic experiences? Do you have plans to target the 2016 Olympics in Rio? ZB: Competing for your country at the Games is different than anything else. There is a weight you don't feel in other venues but it is also the most rewarding for me. There are so many experiences I have from my two Olympics it is hard to pin down just one. The cultural crossover is much greater than you expect before you enter the Village. I think that is what I have enjoyed the most about the Games is just seeing the athletes and people deal with the realities of coexisting in that intense environment. Q: UCI President Brian Cookson has suggested shuffling some of the sports in the summer and winter Olympics. Among his ideas are moving track cycling from the summer to the Winter Olympic Games. What are your thoughts on the proposed move? How would that impact or help your preparation? ZB: I think if the International Olympic Committee would go for it then it is a good idea. The Summer Games is amazing, but it is a bloated event and it is at the point where the sports and level of competition are beginning to suffer just to help accommodate the logistical needs of the Games. The Winter Games are about 1/3 the size and have room to grow. I think indoor sports could all thrive in the Winter Games. The track season is also in a winter season, so I think it would work well. It may also make it possible to have riders that focus on the track full time and make it financially sustainable. Q: You have raced all over the world, both on the track and throughout your road career. What has been your favorite country to race in and why? ZB: I wouldn't say I have a favorite, but there are certainly some standouts and unique experiences. The Arctic Tour of Norway was a race I really enjoyed. It reminded me of home but still had the level and crowds of big Euro races. It was also really well done as a race with some breath-taking courses. Racing on the track in Moscow is also a once in a lifetime experience. Both the track and the city are unlike any other place in the world. 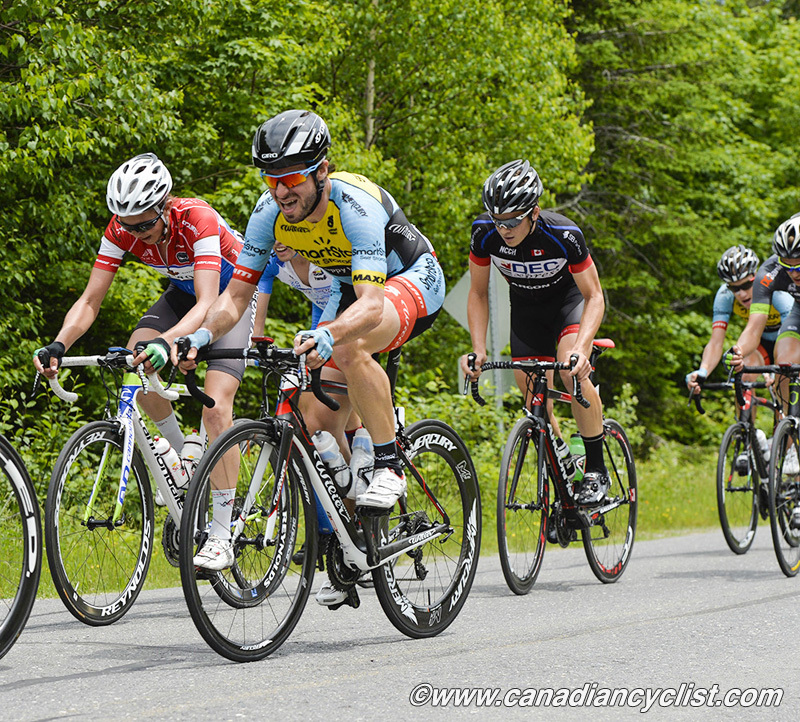 Finally, for me, racing the Pro Tour races in Canada are exceptionally special. They are challenging and hurt and you have to be so good to even have an impact. But if you can have a good ride there as a Canadian it is a special feeling. I got to experience that last year in the breakaway in Montreal. Q: With Champion System Pro Cycling you spent a bit of time racing in Asia. What is the most difficult thing about racing over there? ZB: I actually find racing in Asia generally quite enjoyable. I think the inexperience of some of the marshals can be challenging but it is still much safer than other venues. Overall my experience in Asia has generally been good. As long as you have some patience, generally things go pretty smooth. Q: What do you enjoy to do when you're not riding? ZB: I try to keep pretty busy at home. Spending time outside with my dog, or working on my guitar skill. I also do a lot of work with initiatives I hope will improve things. I have two nonprofit organizations I have started. One to benefit British Columbia Women's Hospital where our first son received his care before he passed, and on to help connect rural kids to sporting opportunities. This one is still in the works. Finally I am working with a number of other people on developing anti-doping programs that go beyond test and suspend policies. There is a cultural change that is needed in sport in general and I think that is a place I can help create a better culture.